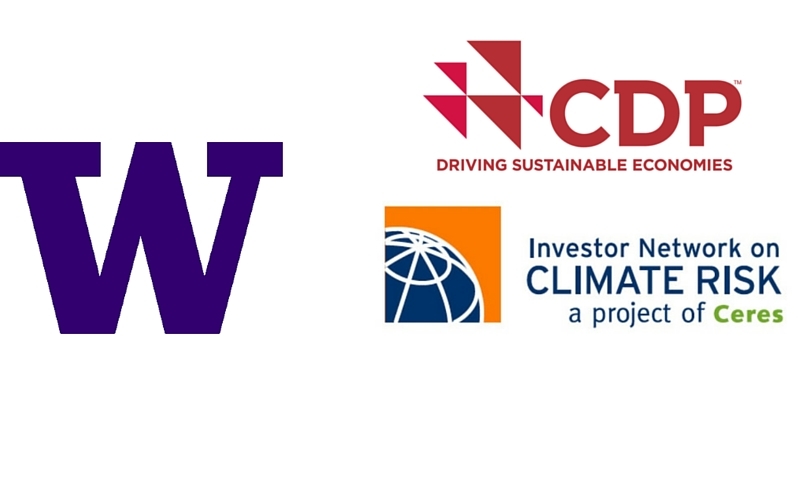 The University of Washington recently joined two membership organizations focused on climate change and carbon reduction. The UW is now a signatory to CDP (formerly the Carbon Disclosure Project) and a member of CERES' Investor Network on Climate Risk. These memberships are part of the UW Treasury Office&'s Global Climate Change Initiatives, approved by the Board of Regents in November 2013. Treasury's Climate Change Initiatives include an initiative to explore opportunities for shareholder advocacy on climate change. CDP works with companies and cities to disclose their environmental impacts, so that investors can make informed decisions that drive action towards a more sustainable world. The university is a signatory to CDP's Climate Change, Water and Deforestation projects, which will give the UW access to data to help evaluate the climate-, water- and forest-related investment risks. CERES is a sustainability advocacy organization with a mission to mobilize investor and business leadership to build a sustainable global economy. The Investor Network on Climate Risk is a network of more than 110 institutional investors committed to addressing the risks of climate change and other sustainability challenges. The UW had previously signed onto CERES' Washington Business Climate Declaration, a statement which supports using energy efficiently, investing in cleaner fuels, advancing renewable energy and reducing greenhouse gas emissions. These memberships further the UW's goals of being a leader in higher education sustainability. The UW is a charter signatory of the American College & University Presidents' Climate Commitment (ACUPCC) and passed an Executive Order on environmental stewardship and sustainability. For more information, see the UW Sustainability site at http://green.uw.edu.